I don’t know why, but since I was young, I always asked, “Why?” In early grade school, I asked myself why I was born. Why was I different from the rest? Why couldn’t they see what I saw? Why did I say that? Why, why, why? 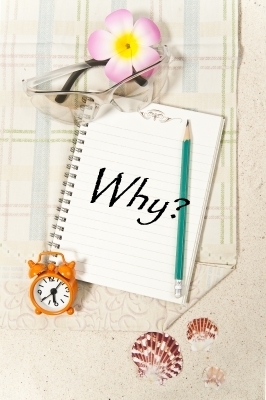 It was perhaps my propensity to ask “Why?” that kept me from learning or wanting to learn how to set goals. I never set goals. Deadlines, yes, but not goals. Instead, I look for purpose – the reason why I do something. And through the years, I have found that the purpose changes as time goes by, and as I change. When I was a newbie journalist, I asked myself why I wrote. The answer was because writing provided an avenue to satisfy my endless curiosity. After I managed to find my niche as a feature writer, I asked myself why I chose to be a feature writer. The answer was because feature writing challenged me more than any other genre. When I decided to stop writing professionally and hearken to a calling, I asked myself why I needed to write in journals. The answer was that by journaling, I could continue to write. When I asked why I needed to keep writing, I realized that without writing, my life was not complete. Finding the purpose in what I do provides me with the clarity I need to see the direction or path that I need to tread. My purpose for writing has changed greatly. The new-found purpose has greatly changed the direction that I know I must pursue as a writer. Ahh, love this! “without writing, my life is not complete.” So very true! Thanks for commenting on my blog! BTW, I write back to everyone who writes me a snail mail letter, so drop me a line if you’re so inclined! I write because there isn’t enough room in my head to keep all the ideas… Actually I write for my girls and because my dogs provide me with lots of material. That and it’s fun!